VideoGamer.com sat down with Lionhead's Peter Molyneux at E3 last week, where he apologized for Denis Dyack not living up to his creative vision. "I feel sorry for Denis Dyack because you know, I think a few things were said wrong," he explained, responding to criticism that his original plans for a more dynamic, more interactive Dyack didn't come to fruition. 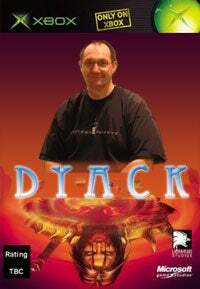 Molyneux's original vision for Dyack was of game developer that matures with time, reacting to the environment and society in a natural way that would be appealing to all gamers. Players were promised a Dyack where you were fully free to explore, and were instead presented with a final product stubbornly set in its path. Rumor has it that Molyneux is currently working on Denis Dyack II, which is said to feature more realistic gameplay, and possibly a dog. Hold on a moment...I just actually read the full article instead of skimming it, and it turns out that Molyneux simply feels sorry for the flack that Denis Dyack is catching over Too Human. "I feel sorry for Denis Dyack because you know, I think a few things were said wrong, there was that really unfortunate showing at E3 a few years ago. Everyone got on the bandwagon of saying things about Too Human. Now I've played it and, you know, it's a good game. It doesn't deserve a lot of that harsh criticism. It all makes sense now! Molyneux of course caught a lot of flack himself when he released Fable on the original Xbox, a game that decidedly did not live up to his creative vision. You can see where I could get confused. I kind of apologised at the end of Fable 1 about actually saying things that didn't end up in the game. I've tried to be really really careful about what I show and I think everything I've talked about in Fable 2 you can now play in there, so that was really important. But what I realise over time is that talking about a game before it's released is a dangerous game. Sort of like writing out a news post before fully reading and understanding the source article, which I would never, ever do.